Performance and style combine in the Agility to create an excellent value. The Shakespeare® Agility spinning reel contains a 4+1 bearing system for a smooth retrieve. The double anodized ported aluminum spool reduce weight and provide corrosion resistance. Complete with a multi-disk drag system provides great fishing performance. Performance and style combine in the Agility to create an excellent value. 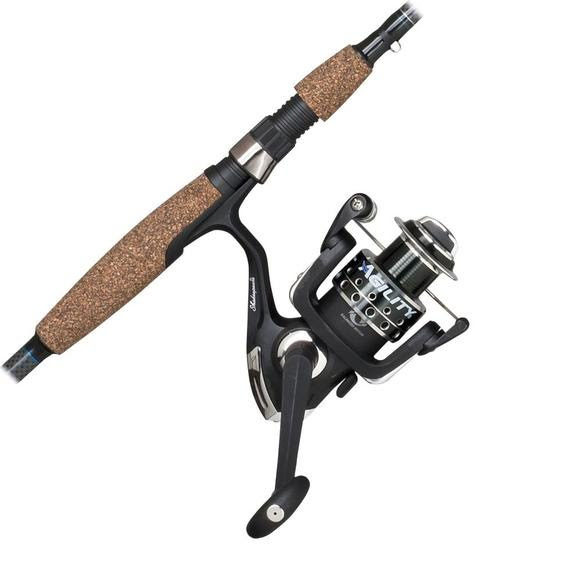 The Shakespeare® Agility spinning reel contains a 4+1 bearing system for a smooth retrieve. The double anodized ported aluminum spool reduce weight and provide corrosion resistance. Complete with a multi-disk drag system provides great fishing performance. The graphite composite rod provide a great balance of sensitivity and durability. The HTG™ grips "Hybrid Tech Grips" provide a great grip for sure hook sets.